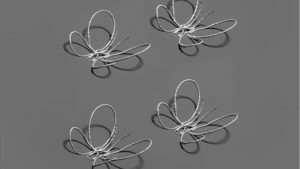 Harvard tech allows for mid-air 3D printing of metal structures with a new technique to make the process easier. It allows people to essentially draw minuscule metal items in mid-air. Created at Harvard’s Wyss Institute for Biologically Inspired Engineering and the John A. Paulson School of Engineering and Applied Sciences, the technology incorporates an ink composed of silver nanoparticles. That ink is extruded through a tiny glass nozzle along x, y and z axes. Although it’s initially in a gel-like form, it’s hit by a laser almost as soon as it comes out, the heat causing the silver to harden into a solid. The spacing between the nozzle and the laser is crucial. If they’re too far apart, the strand of ink will sag before it hardens – if they’re too close together, the laser will heat the nozzle itself, causing the ink to solidify within it. As it is, though, the result is free-standing three-dimensional structures made from electrically-conductive silver nanowires that are thinner than the width of a human hair. These can take on whatever shape is programmed into the printer – as can be seen above, they can even be made to look like butterflies. The research was led by Prof. Jennifer Lewis, and is described in a paper that was published today in the journal Proceedings of the National Academy of Sciences. The process can be observed in the following video. And should you be interested in drawing larger metal objects in the air, check out the bike and the bridge made by a specialized version of the Mataerial 3D printer.